Carbon Chair is a consistently constructive and yet formal and experimental design by Thomas Feichtner. It is a sheet of carbon fibre, which contacts the floor at three points and depicts a line from above and below, positively and negatively. The result is a formal interplay of inner and outer surfaces – a recurring theme that runs through many of Feichtner’s works. (Limited Edition of eight pieces). The Carbon Chair is part of the exhibition 'Austrian Design Pioneers' during the Milano Design Week 2015. 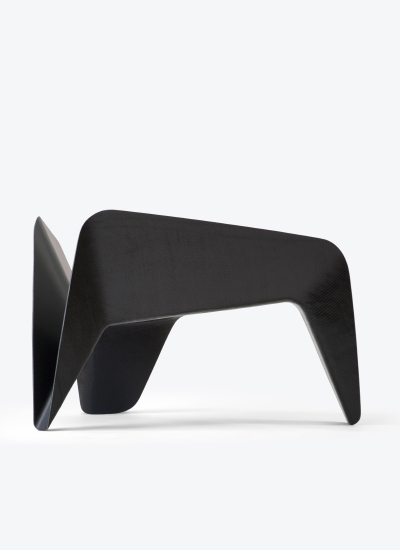 Der „Carbon Chair“ ist Teil der Ausstellung „Austrian Design Pioneers“ zur Mailänder Design Week 2015.